4 begins the X action by cutting first off 5 to the left block. 2 (Shooter) follows, cutting over 5 to the right block. As soon as 2 passes, 5 sets a down screen for 1 (Shooter) in the middle of the lane. 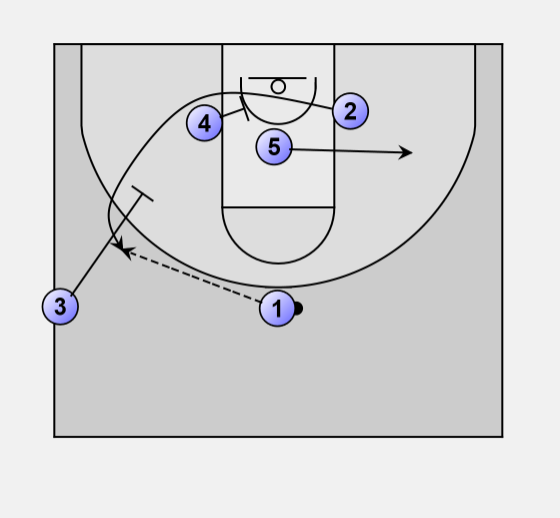 3 looks for 1 coming off the screen for a possible three point attempt. If 1 does not have the shot, he looks to pass to 2, cutting off staggered screens from both 4 and 3.